Cyber bullying is bullying that occurs via the medium of electronic technology. Bullying that takes places using technological devices such as computers, smart phones etc. making use of digital communication platforms such as social media, forums, text messages, chat, and other interactive websites. Cyber bullying is a menace to the current generation. 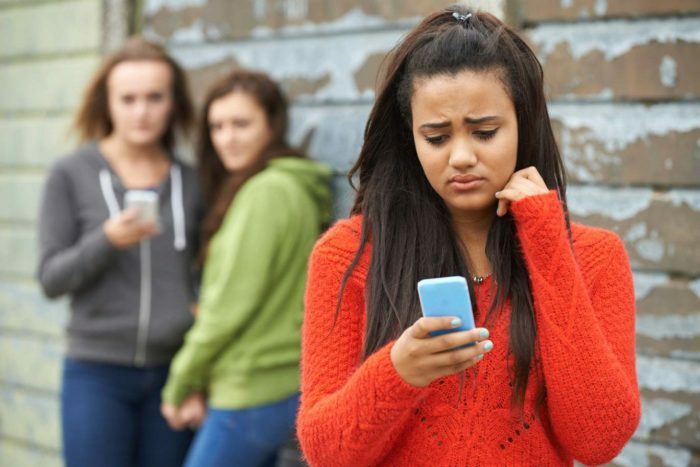 Statistics reveal that 95% of teenagers using social media(with Facebook topping the list) have been victim to cyber bullying. Sadly, only one in ten children confide in their parents or a responsible adult about being a victim of cyber bullying. Cyber bullying victims are 5-8 times more likely to attempt suicide. The examples are plenty. Kelly was in ninth grade when the horrors began. One of her pictures on social media went viral amongst her friends as she looked awkward in it. Soon, she started gaining unwanted attention and the shares started building up and the pictures were even made into memes. She was publicly embarrassed and humiliated with comments (like ‘ugly’ ‘can’t stand looking at her’ and ‘monster’) about her body image. Kelly was deeply hurt and demotivated. Her confidence was shattered leaving her feel vulnerable and weak. She spent her nights crying under the blanket and days hiding away from those bullies at school. However, fleeing is not an option in the virtual world…! And why did it happen? She was just another teenager going through an awkward puberty. A harsh truth, but the effects of this hideous crime leaves scars for life. Cyber bullying does not just pertain to insulting remarks about others. There is a lot more than that which shapes the term. Teenagers who engage in cyber bullying tend to have less empathy and no guilt of their deeds! Research emphasizes that the role of parents plays a vital role here. Lack of parental supervision of online behavior and improper communication between the parent and child are the primary reasons for resorting to bullying on the internet. Victimization of teenagers has been increasing tremendously over the past ten years with an even more detrimental effect on them. How can you protect your child from entering and falling prey to the dark side of the online platform aka Cyber Bullying? Talk to your teen about cyber bullying, explain the dangers and horrific consequences that it brings along. Tell them that the anonymity that comes along with the internet, brings in its share of dreaded consequences. Set time limits and implement strict rules for your child before buying them mobile phone, laptops and other gadgets. Make it mandatory for your child to not send any demeaning texts, suggestive pictures or messages to anyone with an intention to make fun or mock them. Encourage your teen to always respect personal information and space. Teens ought to understand-To never share passwords or personal data on public platforms. To never reveal information that is connected to them at a personal level. If (at some point) your child falls victim to cyber bullying, let him/her know that you will support and help them out of the situation and in case, you are not around, any trusted adult-a family friend, relative, counsellor or teachers can be reached out to seek immediate help. There is absolutely no apparent reason to suffer alone. It’ll only deteriorate the current scenario. Save the emails/pictures/messages as a form of evidence. Keeping a record will be easy to verify who the bully is. According to the National Crime Prevention Council, victims should completely cut off all forms of communication with the bully. Also, all the popular websites have a “report” or “block” option. So go ahead and report the person targeting your child or in fact any person who you feel is getting bullied. It could happen to any child.